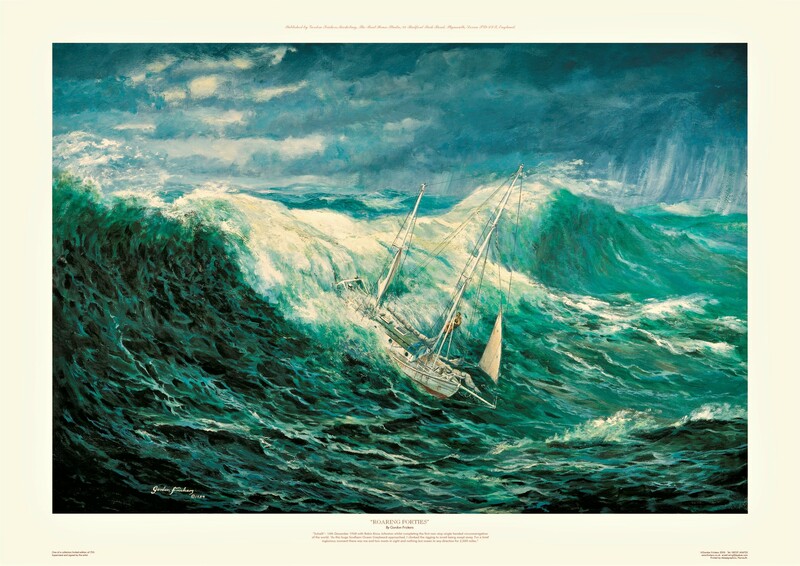 If you have a copy of this classic picture “Roaring Forties“, you may like to keep this with it. Keep in mind the figure on the original is about 2 cm tall so what you are seeing is a remarkable enlargement. 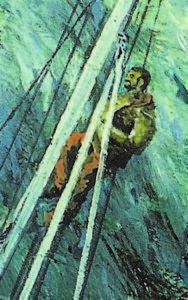 “for a brief inglorious moment there was me & two masts in sight & nothing but ocean in any direction for 2,000 miles“. ~ “I saw this grey beard approaching. It wasn’t the biggest, it looked dangerous. I leapt into the rigging to avoid being swept away” > Robin Knox-Johnston wrote that in a letter to me a few months after our first meeting. Making history, the Golden Globe Race 1968/9. my master printer who proudly keeps a large framed “Roaring Forties”, the only framed print on his studio wall, signed by Sir Robin Knox-Johnston sent me the detail you can enjoy here, from the painting. This particular ‘detail’ has never been shown like this before. I’ve given the web pages of this classic story including the attached ‘Further Reading” a thorough editing and update. This entry was posted on Tuesday, January 15th, 2019 at 1:30 pm	and is filed under diary, Marine Art, Marine prints. You can follow any responses to this entry through the RSS 2.0 feed. Both comments and pings are currently closed.